Butterflies and camels have always been subjects of curiosity: Butterflies are light and buoyant. They pollinate from flower to flower, following the wind and the ephemeral changes of season. Camels are creatures of labor. Where the butterfly is free, the camel weathers all storms and draughts. The camel is self-sufficient, carrying their own water, moving through life with steady strength; always remembering a face or their way home. Can you relate to any of the two? It is our observation that in most social groups, personalities can be matched to these two options. However, in a well blended group they are able to exchange roles, each one able to enjoy a little bit of the other’s charisma. In Communitism, we believe that communication is achieved through common practice. 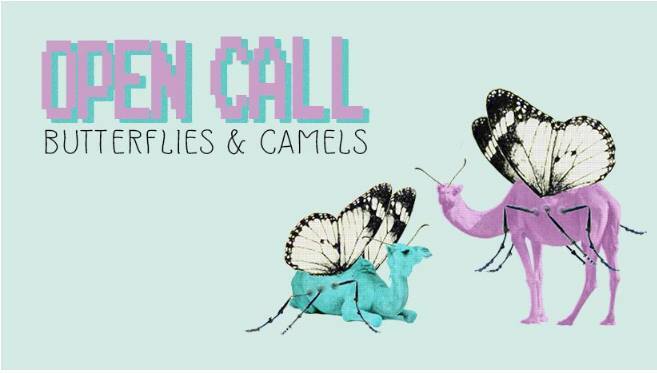 For this reason, and because we are looking forward to embodying a little bit more of the camel or the butterfly, we invite artists, crafters and anyone intrested in learning and sharing to create with us an outstanding fashion show, dedicated to these two lovely creatures and their unlimited combinations. Clothing, accessories and the whole show’s set up will be created by repurposing old garments and materials, through a horizontal skill sharing process. So far we have knowledge in garments, jewellery and lighting making techniques. Everyone is encouraged to share their knowledge and skills with the group. We are looking forward to blending all of our approaches and ideas! By the end of the project, each one of us will have a collectively created outfit to model in the fashion show of Butterflies and Camels, at Communitism Building, end of May 2019. Open workshops start on Thursday 28/03 and for every Thursday and Saturday until the show. Participants will be invited to form their own programme, according to their schedule, the project they are going to develop and the level of involvement they will want to have. The process will be open to new participants for at least the first month of the project.